Typeface is a term we generally think of for a set of fonts—a combination of the type, style, and size for professional computerized lettering. 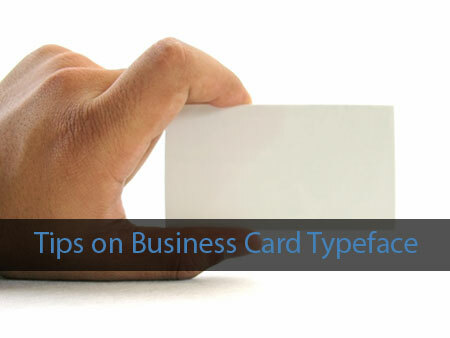 When considering a typeface for your custom or business card template design at business cards, it is important to understand some common attributes associated with type and some common categories of type. Height: The actual height of a lowercase letter is called the x-height, which we often refer to as the size of the typeface. Size: Type is usually measured in points. There are 72 points in one inch (point is often abbreviated as pt). For most body text, we use 10pt or 12pt type, and for display type (headings, titles, etc. ), we use 14pt and up. Spacing: There are two main types of spacing when referring to type: proportional and monospaced. Proportional spacing means that each letter (or glyph) varies in width while monospaced lettering means that each letter is the same width. Early type was monospaced, but today we generally used proportional spacing depending on the document being designed. Style: Style can often refer to regular, italic, bold, condensed and underlined styles applied to text, but there are hundreds of overall type styles. Weight: Stroke designs in type range from thick to thin, all within a single letter. This weight measurement refers to the thick and thin contrasts in the strokes of a letter. Weight is also sometimes referred to as the overall darkness or lightness of type. Although there are over one hundred thousand digitized typefaces, most of them can be categorized into six or seven general groups with similar characteristics. The characteristics within these categories are often associated with specific types of document designs and needs. These categories make it easier to differentiate between typefaces, narrow down the field, and select the perfect ones for your business card design. Other categories of typefaces include distressed, script, calligraphic, handwriting, dingbats, and decorative/ornamental, to name a few. Depending on the nature of your specific business, some of these categories may be appropriate for your professional business cards. Keep it simple. It is acceptable to use a combination of two-three typefaces within the space of a business card, but keep the stylistic attributes simple. Do not overdo it! Avoid using ALL CAPS and underlining, and use italics at a minimum. Note: there are exceptions, if one of these styles fits with your design. Small Caps is an option. Use extremes when working with white space (that blank space where no text or image is printed). When working with large typefaces, use all of the white space (example at the top of the blog). When working with regular size typefaces, keep your typeface sizes and heights reasonable so there is space on the business card where nothing is printing. This helps with readability and gives the business card a clean look. Consider some adjectives that describe the look you are going for: bold or gentle, bright or subdued, ornamental or business professional, plain or outrageous, subtle or trendy, hot or neutral. Match your typeface to your overall theme. Consider the images you have selected for your business card design. Find typefaces that match up. Review adjectives that describe you and your business. Use bold to your advantage. Almost always bold your display type (titles), and reserve bold for those elements of your business card that your really want to stand out. For a more professional business card versus one that is fun and eclectic, consider a Sans serif typeface for the heading and a Serif t typeface for the body text. For a fun and eclectic business card, enjoy working with distressed, script, calligraphic, handwriting, dingbats, or decorative/ornamental typefaces. The key is still moderation. Try them all. As you design your business card—either from your own software program at home or your commercial printer’s design templates—experiment! Enter your text and apply your favorite typefaces to see how they look. Develop a prototype. Have your friends, family, and acquaintances look at your design ideas and give you feedback. If you get similar feedback from more than one person, this may be the track you want to follow. Thinking About Outsourcing White Label SEO? Michael Wittmeyer operates Businesscards.org, an online business cards print shop that specializes in full color business cards. The website also offers a complete design guide as well as a business card blog. Marsha Jones of Pearls 'n' Prose writes for BusinessCards.org. Thank you for posting this. It came just at the right time for me to share with some of my local women’s networking groups. This weekend I went through to scan some of the cards I had accumulated over the past months and realized how many are unreadable do to the font size, spacing or style of font. Seems like everybody is talking about business cards the last couple of days. These are great tips as usual! Please provide more example on this subject matter or will you please tell us some sites that providing examples also.